Gorgeous 3BR/3BA Oceanfront Condo - 4th Floor! - 50" HDTV! This spacious and luxurious three bedroom, three full bath oceanfront condominium at the Grand Atlantic Ocean Resort is located in the most desirable and central location of Myrtle Beach. This fourth floor unit boasts a large living room with a 50" HDTV, a DVD/VCR combo, a new leather sofa and loveseat, new ceramic tile and luxury vinyl plank flooring, new pillowtop bedding in every bedroom, wall mounted 40" HDTVs with DVD players in every bedroom, a large 25 foot oceanfront balcony with a perfect unobstructed view of the ocean, a fully equipped kitchen, and a convenient washer/dryer. Located on the fourth floor, you can park your car in the covered parking garage and walk directly to your gorgeous condo without having to wait for an elevator! Plus, the Grand Atlantic is one of very few oceanfront resorts that offers enclosed hallway access to each unit---during the winter months, you can leave your condo, take an elevator to the bottom floor and access the beautiful indoor pool, indoor kiddie pool, indoor lazy river and the fitness center without ever stepping foot outdoors! This West Indies inspired unit includes a large living room with sliding glass door access to the 25' oceanfront balcony. You will have beautiful unobstructed views of the ocean from the living room and dining room, as well as from the master bedroom, which has a king bed with a new pillowtop mattress, a private bath, a wall mounted 40" HDTV, and sliding door access to the balcony. The spacious second bedroom is furnished with two queen beds with new pillowtop mattresses, private bath and a wall mounted 40" HDTV with VCR. The large third bedroom is furnished with two double beds with new pillowtop mattresses, a full bath and a wall mounted 40" HDTV. A queen air mattress is also available, making the three bedroom unit capable of sleeping 12. Grand Atlantic is a great resort for year round vacationing. The resort's amenities include a beautiful indoor heated swimming pool, 170 foot indoor heated lazy river with rafts, and a large indoor heated kiddie pool with mushroom waterfall and bubbling fountains. Outside, the resort boasts a 65' outdoor pool and another kiddie pool with mushroom waterfalls. Chaise lounges surround the outdoor pools, and a well-kept lawn area with chaise lounges provides additional space for sunning! The resort also offers a large fitness center, a mini mart and an excellent grill/ice cream shop. You may never tire of the beautiful beach and pools just steps away from your condo, but numerous activities and attractions await you in the Myrtle Beach area. The Grand Strand boasts over 120 golf courses, many designed by such famous names as Arnold Palmer, Jack Nicklaus, Tom Jackson, Pete Dye, Greg Norman, Tom Fazio and Davis Love, III. Myrtle Beach has been dubbed the 'Golf Capital of the World' by many. In addition, nearby shopping is available at the Coastal Grand Mall, Tanger Outlets, Barefoot Landing and Broadway at the Beach. Attractions such as Alligator Adventure, Dixie Stampede, the Carolina Opry, The Palace, Hard Rock Cafe, House of Blues, Alabama Theater, Ripley's Aquarium, Nascar Speed Park, Brookgreen Gardens, Bass Pro Shop, miniature golf, water parks, deep sea fishing, and river cruises are all just minutes away. Tennis and basketball courts are also available at a public park within walking distance of the Grand Atlantic. We know that you will enjoy your Grand Atlantic vacation whether you're relaxing on the beach or experiencing the numerous activities Myrtle Beach and the Grand Atlantic have to offer. 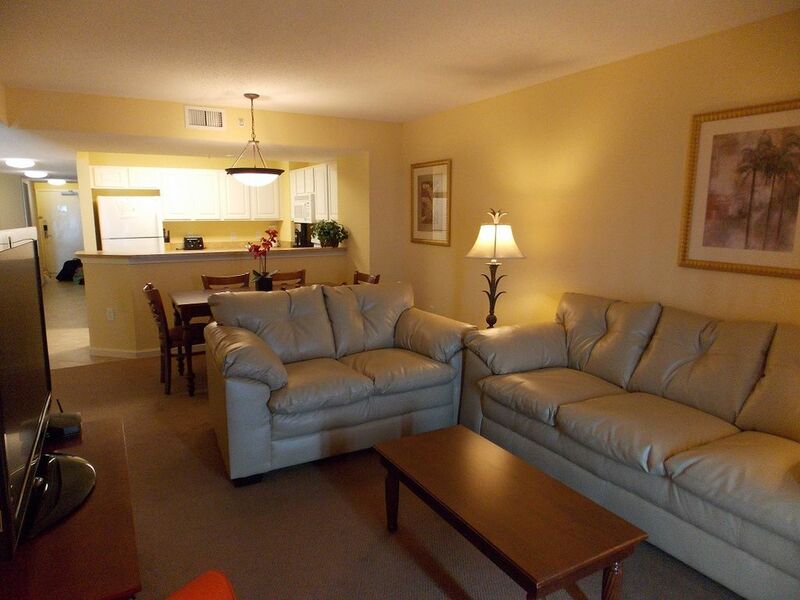 Our tranquil condo will welcome you home after your long day golfing, shopping or lounging on the beach. Come enjoy all the Grand Atlantic and Myrtle Beach have to offer. Perfect Oceanfront view from 25' 4th Floor Deck! TV's in every bedroom! 47" Big Screen TV in living room! Huge 25' oceanfront balcony accessable from living room and master bedroom with unobstructed view of the beach and ocean! (4) The resort features a beautiful indoor heated swimming pool, a 170 foot indoor heated lazy river with rafts, and a large indoor heated kiddie pool with mushroom waterfall and bubbling fountains. Outside, the resort boasts a 65' outdoor pool and another kiddie pool with mushroom waterfalls. Chaise lounges surround the outdoor pools, and a well-kept lawn area with chaise lounges provides additional space for sunning! Nice,clean and quiet unit right on the ocean.. great views and a gorgeous beach. The covered parking was very nice . The owner was very easy to deal with and answered any questions quickly. Would stay here again. Couldn’t have been more pleased. Condo was clean, well equipped, had plenty of space and a great view. Joe is awesome and super helpful. Would love to stay here again!!!! This condo was perfect and so is the resort. This was our 3rd time at this resort. Beautiful views of the ocean. The condo had everything we needed and was very clean and comfortable. The host was very prompt with responses and answered all of our questions. We will be going back and would definitely recommend this condo to all. The owner is great to work with. The condo is nice, bedrooms are spacious. The family room is a little small if you have more than 4 or 5 people and plan to watch movies or sit around. The furniture is all updated, beds are comfortable. I was surprised that the master bathroom was fairly small considering the size of the unit. I love that sheets and towels were included with the unit and that you could park in the parking garage on the same level as the unit and walk right in. The views of the ocean are incredible. Our stay was in a good location and around friendly people and staff. Everything thing was nice and clean and parking was excellent. I loved it here. Wish we could have stayed longer. Grand Atlantic is a great resort for year round vacationing. The resort's amenities include a beautiful indoor heated swimming pool, 170 foot indoor heated lazy river with rafts, and a large indoor heated kiddie pool with mushroom waterfall and bubbling fountains. Outside, the resort boasts a 65' outdoor pool and another kiddie pool with mushroom waterfalls. Chaise lounges surround the outdoor pools, and a well-kept lawn area with chaise lounges provides additional space for sunning! The resort also offers a mini mart and a fitness center. The resort is just minutes away from Broadway at the Beach, which offers restaurants, shopping, IMAX theaters, movie theaters, miniature golf and much more! In addition, tennis and basketball courts are available at a public park which is just two blocks from the resort! A fishing pier is also less than a mile away!